This is the one. This is the hummus twist you've all been waiting for! 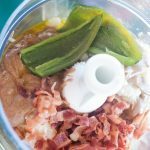 Bacon Jalapeño Hummus doesn't have to be too spicy, but of course that's your prerogative (I had no idea that's how “prerogative” was spelled!). This is how you jazz up a raw carrot! Though I'd probably prefer paleo crackers. This is my moving week. I'm in the new place now, after a couple weeks of living amid boxes lining my hall and stacked in every room. Embarrassingly, they sat empty for most of the last few weeks. It was really only last week that I started to get serious about packing. After having competed 8 years of post-secondary education there is one skill that I have pretty much mastered: procrastination. There are a couple things that are different about this move: 1) I'm using movers for the first time, and 2) most of my kitchen stuff is going into storage. Both of these are reducing my effort by a ton! As I write this, I am on our sunny deck with all three cats enjoying the fresh air, and my roommate, Kimber, is cutting some of the fresh herbs she has grown up here. It smells amazing! I was contemplating why it seems like I have so much stuff, when at the same time I don't… I realized that this world isn't set up for single people: travel is based on double occupancy, restaurants aren't set up for individual visitors, you don't get to hop on someone else's medical plan. The difference between living on your own and living with others is different too. Sure I appreciated having my own space where I often didn't need to put clothes on unless someone was coming over, but I had to pay for all the utilities, do all the chores and cleaning (unless I could convince a guest to give me a hand after cooking them dinner), and I had to furnish the whole place. So my place has all the same things that a home with a full family would have. This was one of only a couple moves that I've made on my own where I've been a functional adult and have furnished my entire living space on my own. I didn't have a partner or roommate that shared the burden this time. My kitchen is, not surprisingly, pretty well stocked, both with equipment and ingredients. So moving in with Kimber who has one of the best equipped kitchens you've ever seen, well, there is very little from my kitchen that isn't staying in boxes or going to friends' houses. There will be boxes of food lying around for the rest of the summer, I'm sure, as we gradually make room for everything that came with me. There are definitely worse problems to have! Look forward to meeting Kimber (she is the beautiful mind behind the Rhubarb Banana Crisp) and the cats over the next few months, and some amazing food coming out of this kitchen! 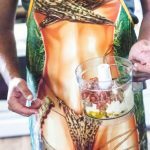 Kimber will no doubt have some featured recipes on the way. I really should have told you about the Bacon Jalapeño Hummus, since this flavor combination makes my mouth flood with saliva every time I think about it. I might need to make a batch of this this afternoon for Kimber to try (and use some of the frozen cauliflower taking up space in the freezer!). Ooh! It would be killer in a Hummus Omelette too!! Don't be surprised if you see some Bacon Jalapeño Hummus omelettes on Instagram or Twitter this week! Bacon and jalapeño? Hell yeah! This dip only gets better with each bite! Roast the jalapeno peppers. This can be done over a BBQ or gas burner's flame, or in the oven under the broiler. You want to blacken all of the skin, so turn as needed (use a pair of tongs so you don't burn yourself). Remove from heat and allow to cool to a point that you can rub the burnt skin off with your fingers. Cut off the top and then slice lengthwise. 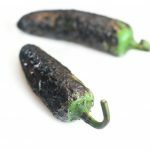 Depending on your heat tolerance, you may not want any of the jalapeño seeds. It may depend on how hot your peppers are as well (I've found jalapeño peppers to vary wildly). My intent was not for an overly spicy recipe, just to have the flavor of the flavor, so I recommend that you leave out the seeds and add them in gradually at the end (I ended up using the seeds from one of the peppers in my hummus). Taste and add salt and/or jalapeño seeds as needed. Good call on the kale chip – bacon hummus combo Aimee! Bummer about the bacon, but as long as the taste is OK, this would be perfect! This has got me excited :D! Great recipe! I like your and Emily’s site! How long have you guys been doing that? Thanks for checking it out Raj! It’s been going about 2 years casually. We are in the middle of trying to really grow it into something better that could actually help people. Love what you have done with the audio for your posts too, by the way. We have been trying to create a lot more video content but it can be crazy difficult talking to a camera, haha! I hear you bro. We’re pretty much the same. If you come up with any collaboration ideas, please drop us a line! That would be great, I will for sure :). The same to you if there is anything we can help with! I’m wondering about the portion that mentions ‘can rub the burnt skin off with your fingers’. Is that what’s to be done? I over-charred one when I tried making it again and needed to cut it off. But yes, remove the skin after. Just like you would with roasted bell peppers etc. Oh yesssss! Wow! I never thought to make hummus with the cauli! What a great idea! I love this flavor idea! Heck yeah! We’ve got many more ideas for hummus flavors to come! Bacon jalapeño?!! Wow! I bet this hummus tastes amazing! The BEST flavor combo! I love bacon and jalapeno together. 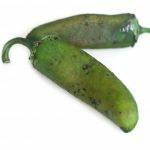 Makes you want a jalapeno popper, doesn’t it? Congrats on the move! I know how tough it is, but it sounds like you’ve got a great set-up! So looking forward to new recipes in the stocked kitchen. This one is a winner. I love bacon and jalapeno together, so I’ve gotta test this one out. This was originally from a year ago, and sadly, I have to move in a couple months. If you know anyone with an epic place/kitchen in the general area (or maybe not this area…), lemme know. 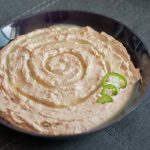 This hummus looks so creamy and delicious! I love the flavor combo- yum! 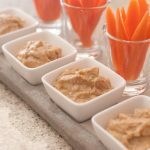 This sounds like the perfect dip for veggies or paleo crackers! Spicy and smokey with bacon, Sign me up! What an interesting flavor combo ! I think my husband will like it very much ! MMMM This looks sooo good. Bacon and cauliflower are such a good combo! Well… bacon and ANYTHING! This sounds incredible! My kids don’t like eating cauliflower so I’ll give this a try with them with lots of things to dip it into. Wow, this in above in a beyond creative and it looks so fantastic! 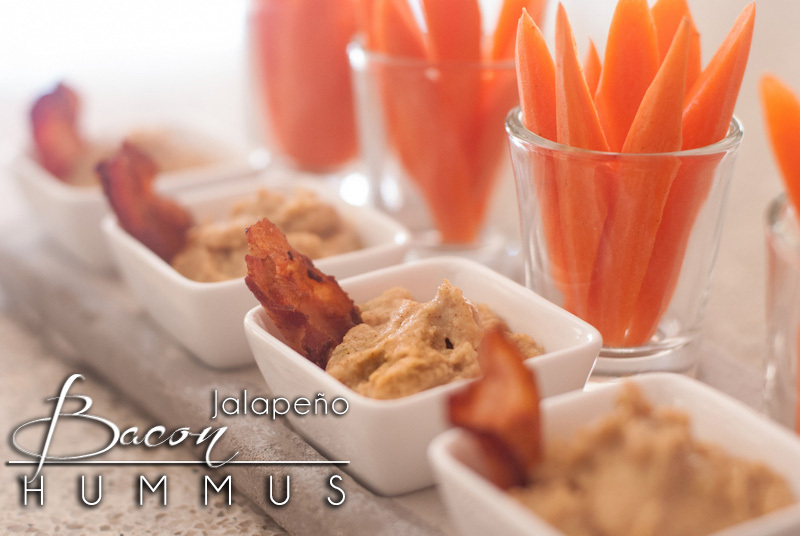 I love any and all hummus, but add a little bacon + jalapeno and I’m pretty sure I won’t be able to stop eating this! Good thing it’s so healthy!! 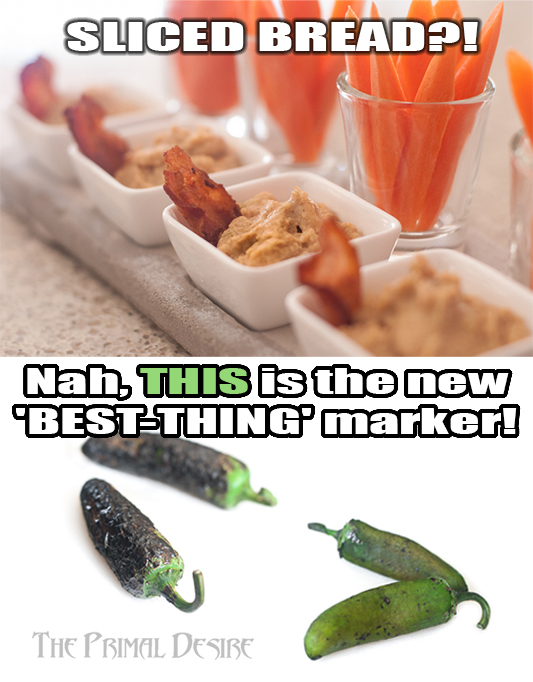 You really can’t go wrong with bacon and jalepeno! Such a genius idea! WOW!!! I cannot wait to try this. The roasted jalapeños here are genius! And yeah, everything is better with bacon. Looks great, Raj! Thanks Ashley! You’re doing the deep dive into the site eh?